That Rupert Murdoch may tilt the news rightward more for commercial than ideological reasons is beside the point. What matters is the way that Fox's model has invaded the bloodstream of the American media. By showing that ideologically distorted news can drive ratings, Ailes has provoked his rivals at CNN and MSNBC to develop a variety of populist and ideological takes on the news. In this way, Fox hasn't just corrupted its own coverage. Its example has made all of cable news unpleasant and unreliable. What's most distinctive about the American press is not its freedom but its century-old tradition of independence—that it serves the public interest rather than those of parties, persuasions, or pressure groups. Media independence is a 20th-century innovation that has never fully taken root in many other countries that do have a free press. The Australian-British-continental model of politicized media that Murdoch has applied at Fox is un-American, so much so that he has little choice but go on denying what he's doing as he does it. For Murdoch, Ailes, and company, "fair and balanced" is a necessary lie. To admit that their coverage is slanted by design would violate the American understanding of the media's role in democracy and our idea of what constitutes fair play. But it's a demonstrable deceit that no longer deserves equal time. Is it really fair to say that Fox "made all of cable news unpleasant and unreliable"? All three are responding to market forces -- Murdoch was simply the first to recognize that a cable news channel with an ideological/partisan slant could attract larger audiences. Also, while I have no love for Fox, which is a frequent conduit for misleading claims, it's not clear to me that non-"objective" journalism is in principle bad for American democracy or "un-American." The sad reality is that the "he said"/"she said" reporting style practiced by the establishment media legitimizes far more misinformation than Fox ever will. As my co-authors and I argue in the conclusion to All the President's Spin, responsible but non-"objective" journalism is sometimes better at countering spin than the mainstream press. With a few exceptions, Fox tends to fail to produce that sort of journalism, but there's no reason to think it couldn't be produced here in the US. At a more general level, I see Weisberg's comments as part of a pattern in which elite pundits decry the decline of the "objective" press and/or bipartisanship, which are held up as intrinsic to American democracy. What they often don't realize or appreciate is that both were historical anomalies. Consider objective journalism. Until the late 19th/early 20th century, the press was largely partisan. This pattern didn't change until economies of scale in printing created incentives to attract a larger audience by producing independent newspapers (see Jay Hamilton's All the News That's Fit to Sell). Similarly, the only television news available for many years came from the broadcast networks, which faced regulatory pressures and economic incentives to provide "objective" coverage as well. However, the economic incentives facing media outlets have changed and it seems likely that non-"objective" sources will again play a large role. As the South became largely Republican and the parties realigned on the issue of race, the system returned to the previous norm of polarization that we observe today. In short, our system of government is more flexible than people realize. We're moving toward a more partisan era in Congress and the press, but that isn't necessarily bad for democracy. -- CBS News' use of crude forgeries trying to sway the 2004 election. -- giving minimal reporting and no investigation of the expanding ACORN scandal. -- smearing Limbaugh using obviously fake quotes. -- giving Obama enormous air time to sell his Health Reform, while giving much less time to opponents of his plan. Perhaps the more interesting question is why. Brendan says CNN and MSNBC were responding to market forces. If so, they're not very good marketeers. Companies normally copy a successful competitor. A more normal market response to FNC's success would be to move right and get a share of FNC's conservative audience. Furthermore, it isn't working. They're falling farther and farther behind FNC, just as liberal newspapers are falling farther and farther behind the Wall Street Journal. I think most of the media moved left in spite of market forces. They changed because ideology was more important to them than business success. Interesting chart and analysis Brendan. I followed the links to try and understand what is being measured to determine "distance between the parties" but don't have time to read all I found. Is there a succinct explanation of the Y-axis? "Murdoch was simply the first to recognize that a cable news channel with a DIFFERENT ideological/partisan slant could attract larger audiences." Thanks Brendan - that was the quick explanation I was looking for. 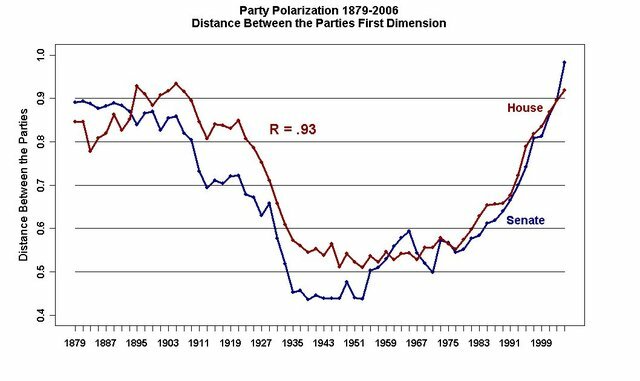 Also interesting about the graph is that in the first half of the 20th century, the Senate consistently tracked below the House in terms of partisanship, but since about 1960 the Senate tracks the House fairly closely, which aligns with the general rise in partisanship you mention above. "A more normal market response to FNC's success would be to move right..."
Why should a news operation should be "moving" in any ideological direction (either left or right)? Thanks for confirming that when conservatives, generally speaking, complain about "liberal bias in the news media", what they're actually griping about is "LIBERAL bias in the news media." Conservative bias in the news media, as is illustrated by their figurative embrace of the F(R)NC, is heartily welcomed by many on the right. And just because the Republican network has the most viewers doesn't automatically mean that CNN and MSNBC should emulate them. If the latter two operations have liberal bias problems, then they should try to be objective, not have a CONSERVATIVE bias. Also I'll just add that 'market forces' shouldn't be unreflectively used as a justification for any behavior. After all there's a market for cocaine and AK-47s, but that doesn't mean a democratic society shouldn't regulate those as deleterious to itself. Of course one can't regulate partisanship, but one can provide a buffer against these relentless 'market forces' which would provide room for less-partisan news to flourish. Take PBS, for example - probably the only thing we have left to somewhat 'objective' journalism.